Breezy until this afternoon and rain until this evening. 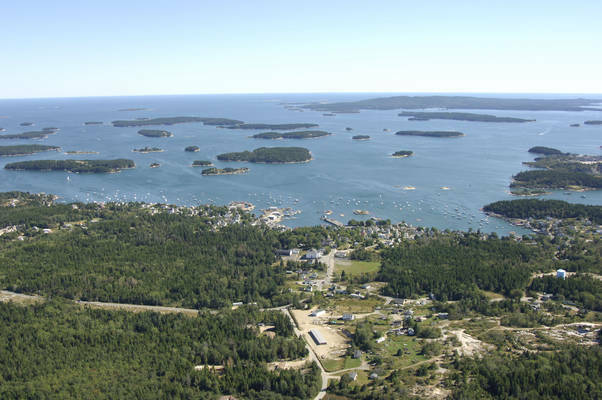 The Deer Island Thorofare is a long, somewhat undefined stretch of water that is located on the south side of Deer Isle. It starts from the west at Mark Island and winds east-northeast past dozens of islands until it empties into Jericho Bay at Potato Ledge. Deer Island Thorofare is seven miles northeast of Vinalhaven and 20 miles southwest of Mount Desert Island.Stonington is the largest town on this passage and is a quaint and well-equipped area. Most of the Deer Island Thorofare is fairly remote and devoid of facilities except for Allen Cove and Stonington, which are located on the western end of the passage. Stonington has a public dock that you may be able to arrange space at, but most visiting boaters hang out on one of the many moorings just off the Stonington waterfront. 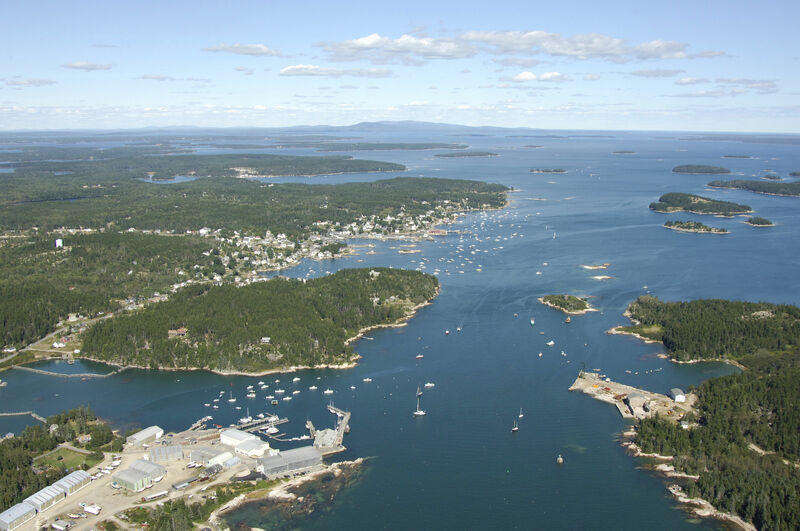 Allen Cove is home to a large repairs and marina facility. The image above is a view from the west looking east over the Deer Island Thorofare at Allen Harbor and Stonington. Off in the lower left-hand corner is the expansive Billings Diesel and Marine facility, while a little farther up on the left is town of Stonington and its larger waterfront. Geographically speaking, if you look far off at the center of the horizon, Mount Desert Island can be seen about 20 miles away. 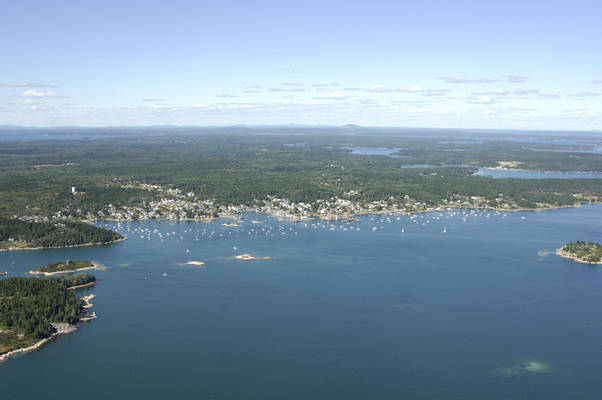 The large forested piece of land on the left (north) between Allen Harbor and Stonington is Green Head. Off to the right (south) is Crotch Island with smaller Peggys Island located just off its northeastern end. Passage through the Deer Island Thorofare is fairly easy and straightforward if you follow the well-placed aids to navigation. We do not, however, recommend transiting the passage at night, as two of the buoys or fixed markers are lighted. 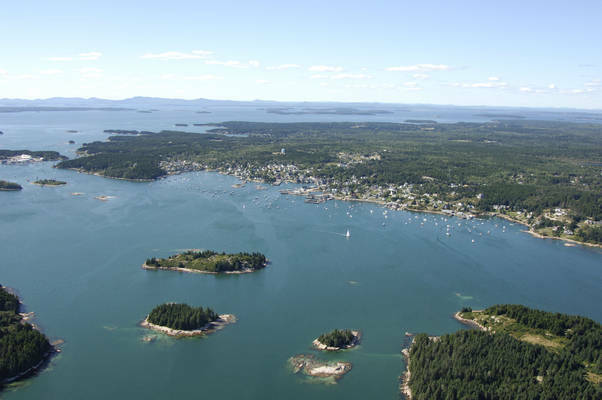 Additionally, Deer Isle and the Deer Island Thorofare are in lobster country. Most of the passage is peppered with thousands of lobster floats, which can make for a real challenge if you wrap one of them up in your propeller. Yet another reason not to travel here at night. Approaching from the west, the beginning of the Deer Island Thorofare is announced by the Deer Island Thorofare Light (52 feet above the water; flashing white every six seconds; horn). 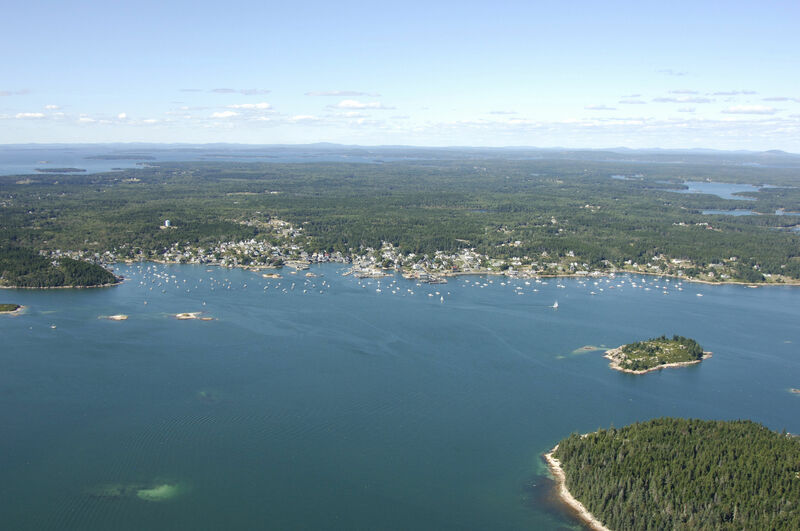 Once you have safely left Mark Island to starboard, set an approximate course of 072 degrees magnetic for .6 miles until you reach green can buoy 27, which marks the location of a small rock ledge to its south; leave the mark to starboard if you are heading west. From green can buoy 27, set a new course of 080 degrees magnetic for .8 miles. Along the way, you will pass green daybeacon 25 to starboard and red nun buoy 24 to port. Shortly after you clear red nun buoy 24, green nun buoy 23 should be visible to starboard. Just past green nun buoy 23, Allen Harbor should be visible just off your port side. This is the location of Billings Diesel and Marine, where, as the name suggests, most any repair can be undertaken (35-ton lift available). Additionally, Billings Diesel and Marine had both gas and diesel fuel and accepts transient guests. 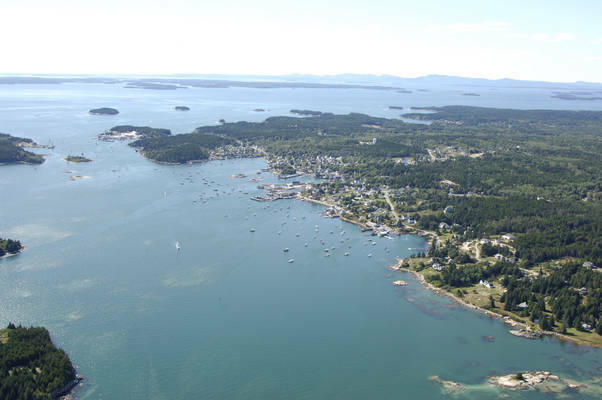 If you are heading to Stonington, proceed northeast toward green nun buoy 19 (visible in the image above), which is just north of Peggys Island, and then head toward the mooring field, anchorage and town waterfront about a half-mile farther northeast. No reviews yet! 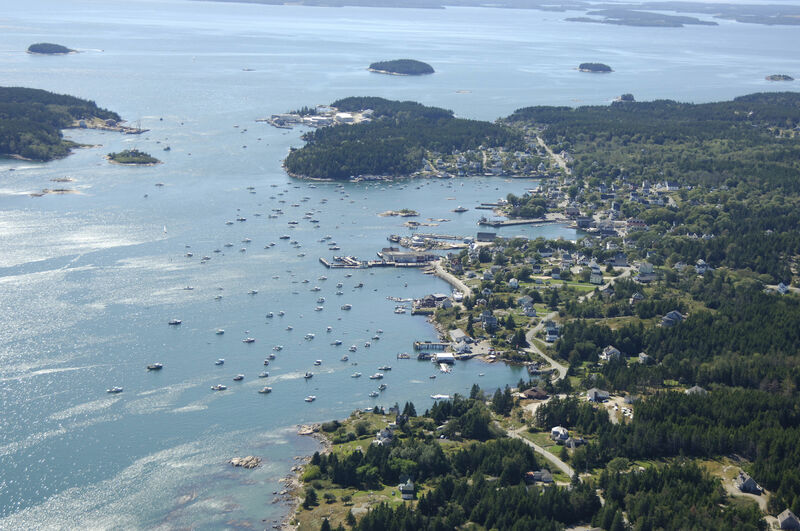 Be the first to write a review of Stonington.